In Singapore, we’re always scouring the island for the best bargains. And we also love travelling around the region to get more bang for our buck. 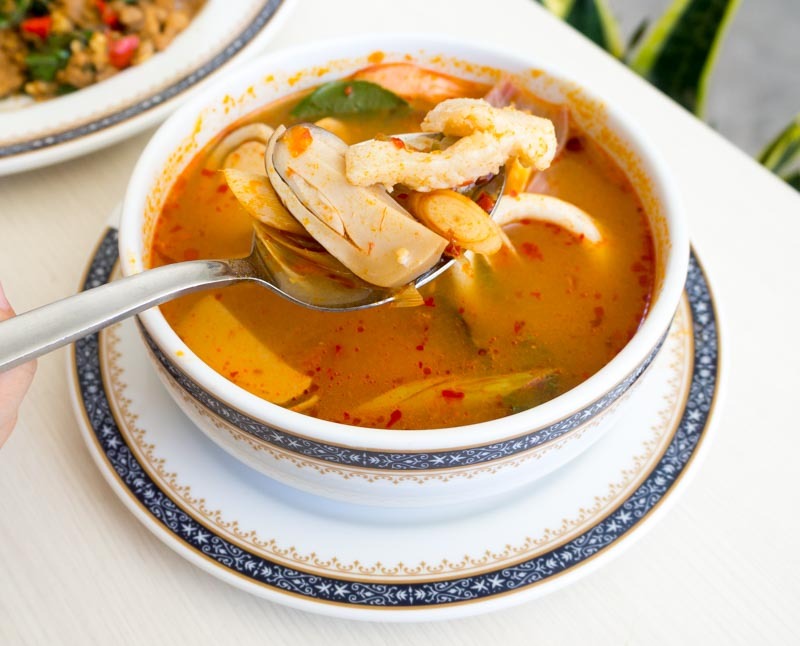 Aching for some cheap and good Thai food but can’t take annual leave just yet? 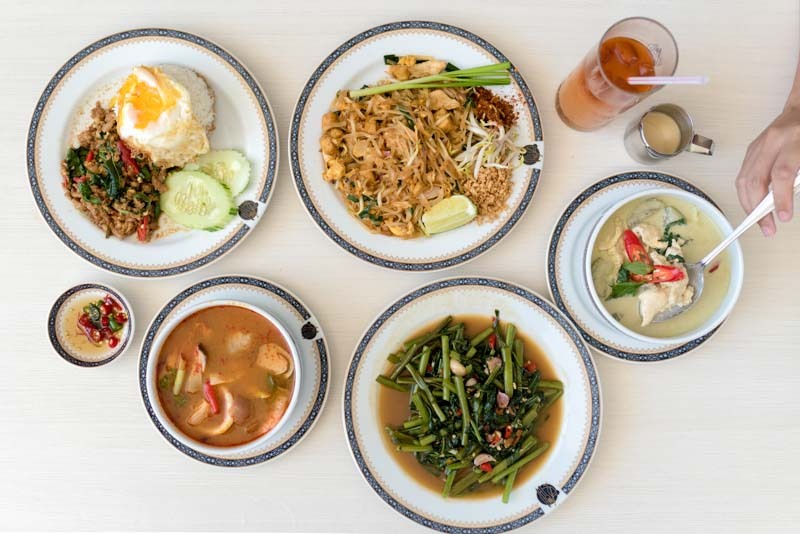 Took Lae Dee (literally translated to “cheap and good”) brings you authentic Thai food without putting a dent in your wallet; and when they say cheap, they really do mean cheap! 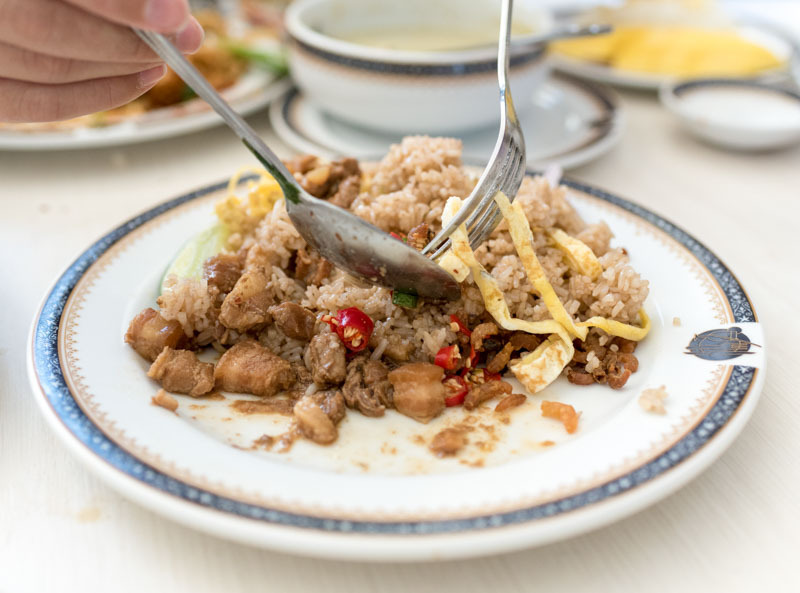 Chances are if you’ve been to Bangkok, you’ve already tried their food. 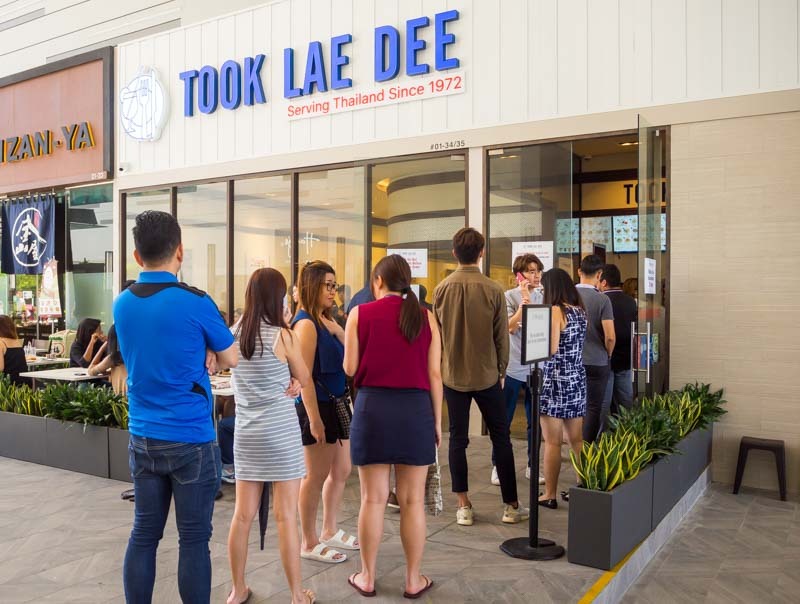 Took Lae Dee is Bangkok’s most famous 24/7 restaurant chain and bless us, because they’ve just opened their first international branch here in Tai Seng. Sadly, the Singapore outlet is not yet open 24/7. The first thing you’ll notice when you get here isn’t actually the restaurant’s sign; it’s the snaking queues. 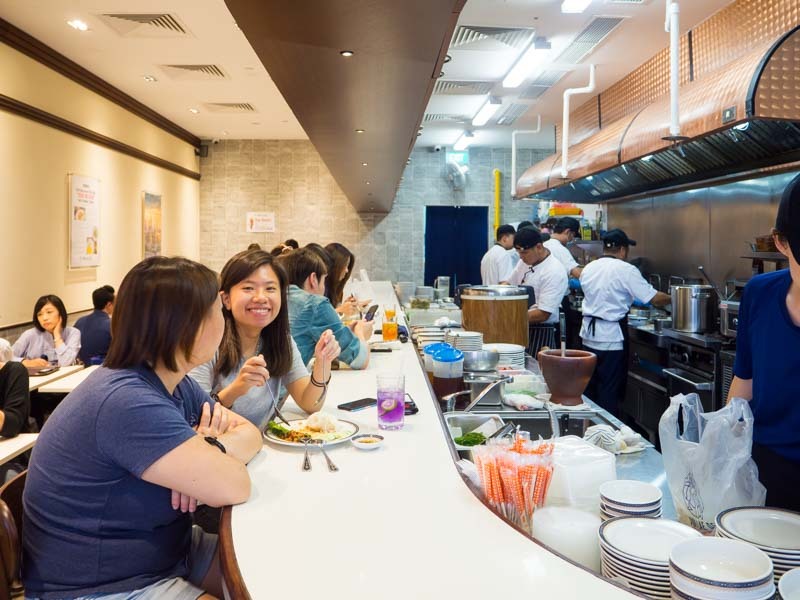 Operating on a self-service system, expect a wait of up to 30 minutes during lunch hour! My suggestion — come early at 11am and grab your fill before you’re swarmed by impatient crowds. While you can catch all the kitchen action at the counter-side seating, we chose to sit outside. It was a little hot, but it was also quieter and even reminded me of slurping up pad thai along the humid streets of Bangkok. The word ‘authentic’ may be thrown around a lot, but Took Lae Dee puts a fresh spin on it. 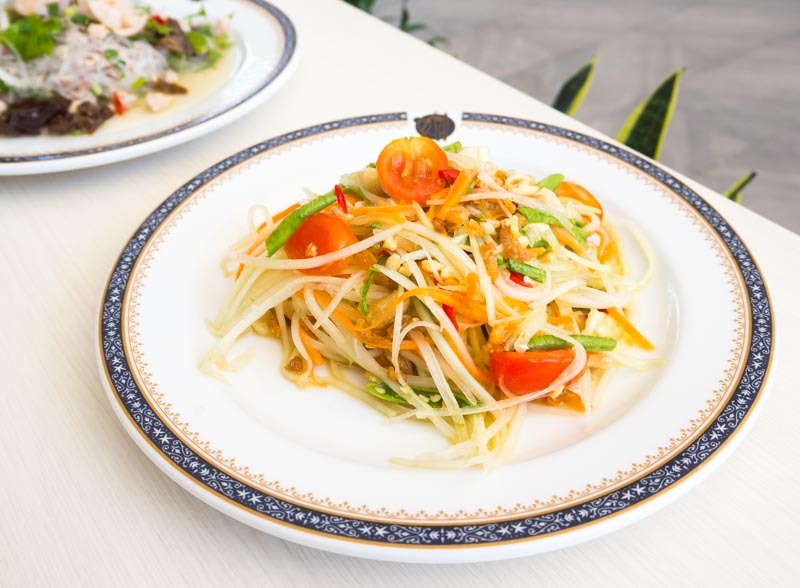 The ingredients are flown in from Thailand wherever possible, keeping the flavours as close to the street food you find in Bangkok. What really won me over, however, is the ridiculously-cheap prices that would put ‘cheap-cheap’ Bangkok to shame! 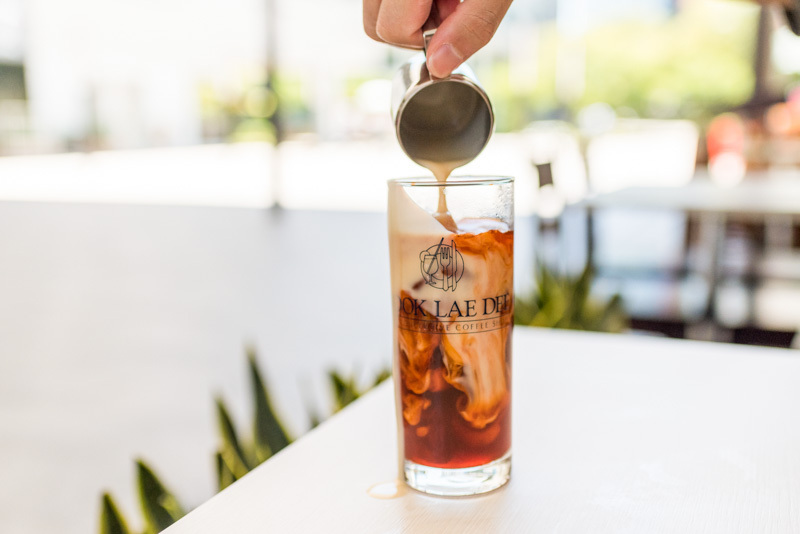 Arm yourself against the impending Thai spices with the Took Lae Dee Iced Milk Tea ($2.80), served with some milk on the side for sweetening. It may be weird to say that you can drink this slowly, but you can, as the ice cubes are also made with Thai milk tea! So you don’t have to worry about your tea getting diluted. Start off with the Som Tum ($6). This green papaya salad had an appetising sour tang that paired well with the saltiness of the fish sauce. My favourite parts were the bits of peanuts and dried shrimp interspersed throughout as they gave a nice contrasting crunch. Disclaimer: we found this quite spicy and even had to order four cups of Thai milk tea to handle it! Don’t be garang if you aren’t big on spice, and request for less spice upon order. I’m not big on salads, but this one was so good that it deserves a mention. Took Lae Dee’s Yum Woon Sen ($6) had citrus notes that were tantalising without being overpowering and thankfully, this dish wasn’t as spicy as the Som Tum. Altogether, the vermicelli salad was light and whet my appetite for the mains. 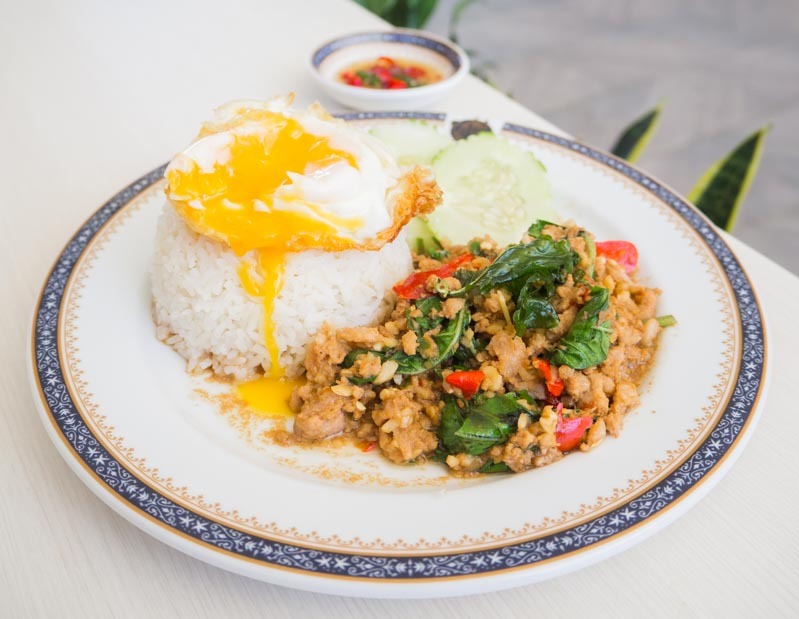 The bestseller here is the Pad Krapow ($3.80). Good for more than just its wallet-friendliness, the Pad Krapow wow-ed with bursts of flavour. Their rendition uses a special brand of basil imported from Thailand, holy basil, which added a unique spice that permeated the meat. The minced pork was also very tender and moist, with every bite oozing with delicious juices. You should definitely top up $1.20 for the crisp Thai fried egg as the gooey yolk brings a richness to each spoonful. Green curry may be a dish that’s a dime a dozen in Singapore, but Took Lae Dee’s Kang Keaw Wan ($7) has easily become one of my favourites. 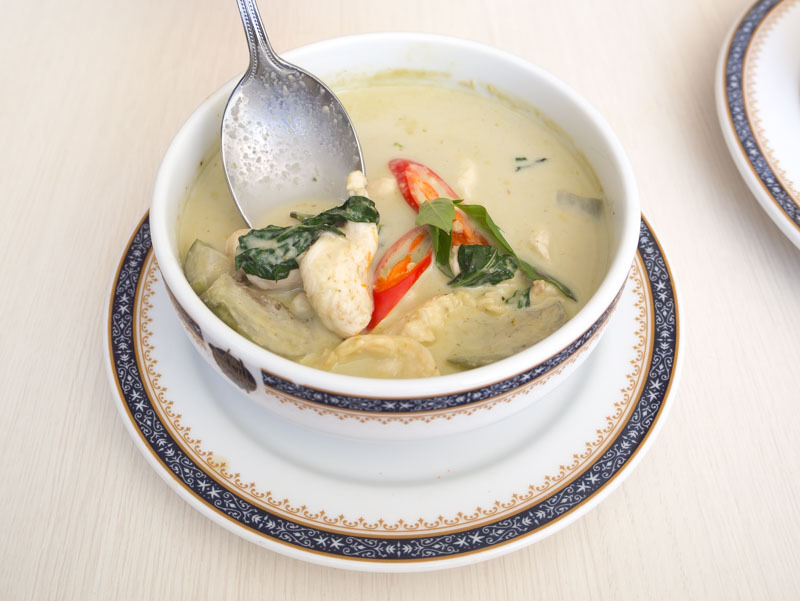 Theirs is a complex creamy and milky curry, uplifted by a refreshing minty fragrance from the kaffir lime leaves. It was spot-on and satiated all my Thai curry cravings! 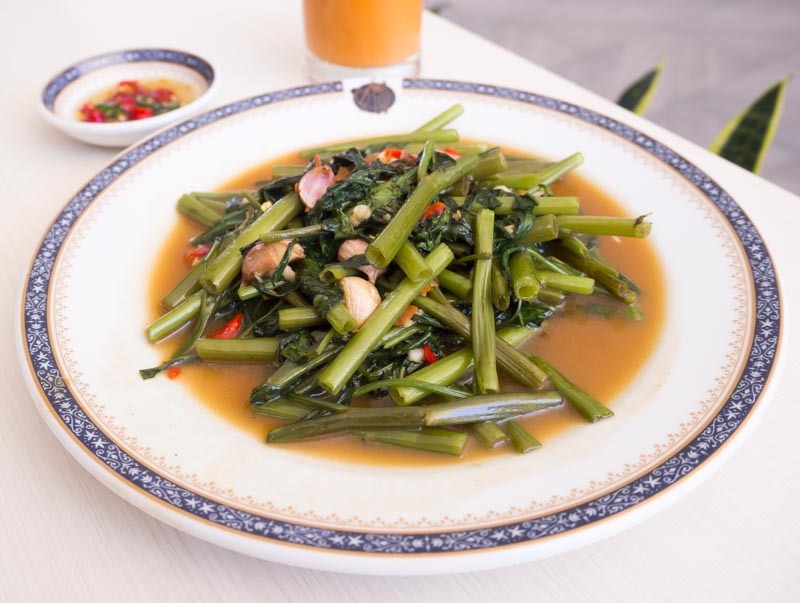 This Pad Pak Boon ($5) may look a little like the kang kong dish you order at zi char restaurants, but it’s actually Thai morning glory. Stir-fried with shallots and chilli, the morning glory had a strong garlicky aroma with a mild lingering spice. This unique vegetable was one of our favourite dishes here. And this is coming from someone who hates veg! 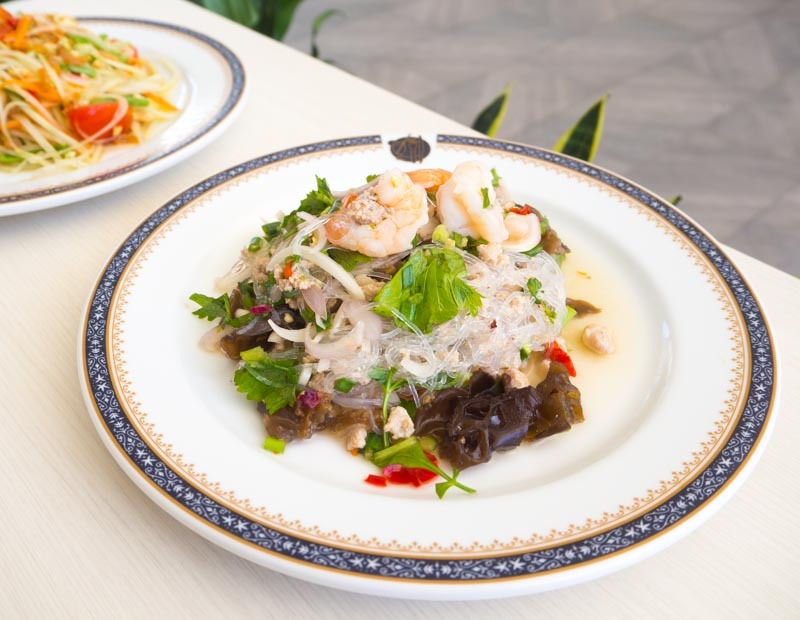 If you’re feeling a little adventurous, Took Lae Dee also offers up traditional Thai fare that you may not have seen before. I enjoyed the Khao Kluk Kapi ($8.80), which was an interesting mix of shrimp paste fried rice, pork belly, dried shrimp and papaya served deconstructed like Korean bibimbap. The best way to enjoy this dish is to mix it all up. Make sure to get some of the sinful pork belly in each bite, as the pieces were fatty and melt-in-the-mouth tender. Of course, I had to try everyone’s favourite Tom Yum ($6.80/$8). Their rendition is definitely value-for-money, brimming with delicious squid, fish and mushrooms. I’m more accustomed to tom yum with strong sweet and sour notes, which was why Took Lae Dee’s mellower flavours were a pleasant welcome. It’s not the best I’ve had, but I still slurped it up to the last drop. 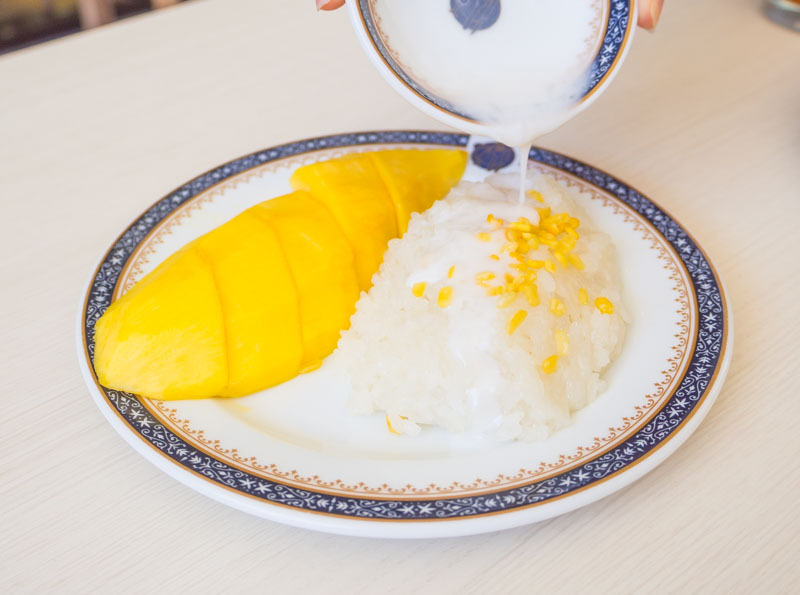 For dessert, finish off with Mango Sticky Rice ($3.80/$5). 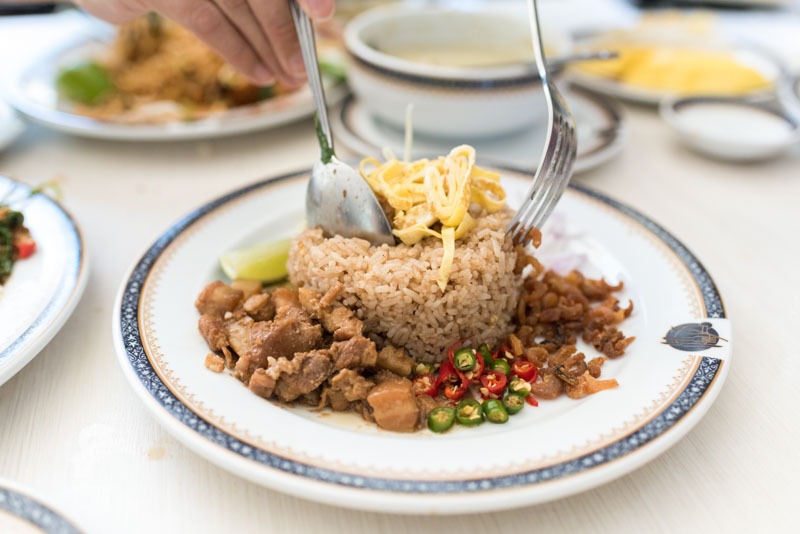 The dish’s seemingly plain appearance belies the complexity of the rice, which was fluffy and perfumed with the strong fragrance from the coconut milk. Sadly, this dish is seasonal, but that means that when you do get to order it, you’ll always get sweet ripened mangoes. Pinch me, because it’s not possible for Thai food that’s this authentic to be this cheap. As a broke twenty-one-year-old, the low cost (all NETT prices) here is seriously the answer to my food prayers. Now I’m just waiting for the day that Took Lae Dee becomes 24/7; this would absolutely be my new go-to supper haunt!